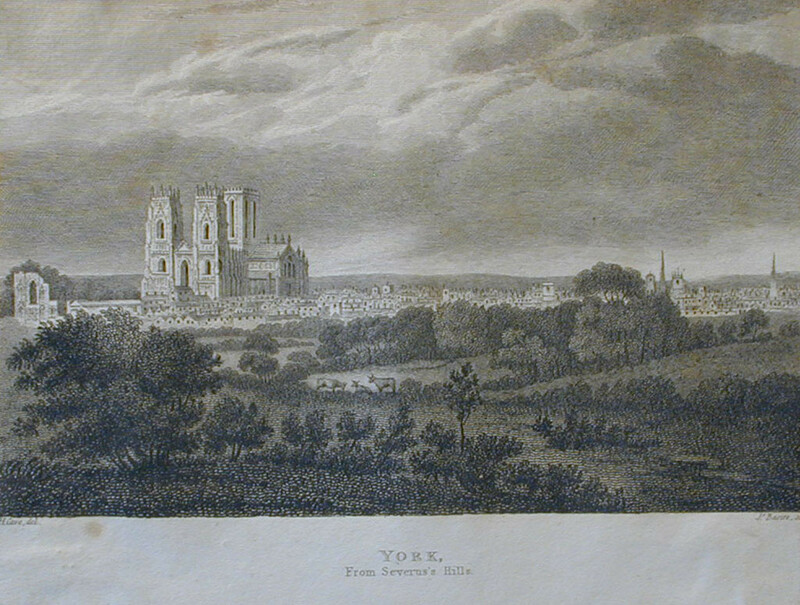 A while back, before the recent silence regular readers may have noticed, I saw York from a vantage point I’ve not appreciated it from before, from Severus Hill. Is that the wolds in the distance? Remarkable views from up here. It has changed a bit in the last couple of centuries, as you’d expect. Since Henry Cave’s depiction the cows have gone and the fields have been covered with roads and houses. We defend the small green spaces that are left. A planning application to build on Severus Hill was the reason I went up here on 8 October, on the way to take photos of the Carlton Tavern for an earlier page. The Carlton Tavern (formerly the Godfrey Walker home) is just down the road from where I took the photo above, at the bottom of the hill, to the south. The planning application to build housing on the green area on Severus Hill was refused, so that’s one less thing to worry about/get engaged with/spend time on. The planning application to demolish the Carlton Tavern (17/00476/FULM) was however approved, at the meeting on 18 October, and that’s one of the reasons I’ve not written much in the last couple of months, managing only one page. I’ve tried to write, several times, but never managed to hit ‘publish’, as the writing turned a bit ranty for my liking. “A local resident and the Victorian Society have queried to way in which we interpreted national policy around heritage assets when arriving at our decision. When I watched the webcast of the meeting and listened to local residents and councillors giving their thoughts on the proposed demolition I really thought that something had shifted at last, that intelligent thought and hard work and people power had at last come together to mean that this kind of short-sighted destruction would be refused. At last, something truly invigorating from all those planning meetings I’ve watched, and six years on from the first demolition of a ‘heritage asset’ I really cared about. I just couldn’t write about York things for a while. Seemed better to disengage and think about other things, rather than bothering to put energy and time into trying so hard to articulate the importance of local character, distinctiveness, history and heritage. Money talks loudest and the planning system is so weighted in favour of developers. Our elected councillors are our only hope, and when it’s that close on the vote, as it was in this case, it’s one opportunity to stand up for something locally valued, and for reasons I don’t understand the chair decided to vote to approve. I’ve been observing this city quite closely for many years now, and the result of that is that I’m more of a realist. I didn’t expect the council to replace Stonebow House with a park, for example. It’s usually all about the value of land, land values, who owns it, who can afford to buy it. But every now and then it would be good to see our elected representatives fighting a bit harder to defend the heritage valued by the people they represent, and in particular the heritage out in the suburbs, where most of us live. Looking out from Severus Hill I felt a fondness for and attachment to the place that I get rarely now. York set in its landscape, the bigger picture, the hills beyond. But the city we see below us is basically parcelled pieces of land, plots with different owners. As more hotels go up, more pubs are sold off and demolished, it often feels like the city is being sold off, bit by bit, to people who don’t understand it, don’t give a damn about its heritage (what we inherit, that’s important, it’s the thread making the coherence, the history, the stories, making the place). So much now owned by people investing, passing through, not here really, just in it for the money. Every week seems to introduce yet another restaurant or cafe catering to the tourist market. The city centre is home to more Airbnb type occupants than full time residents. 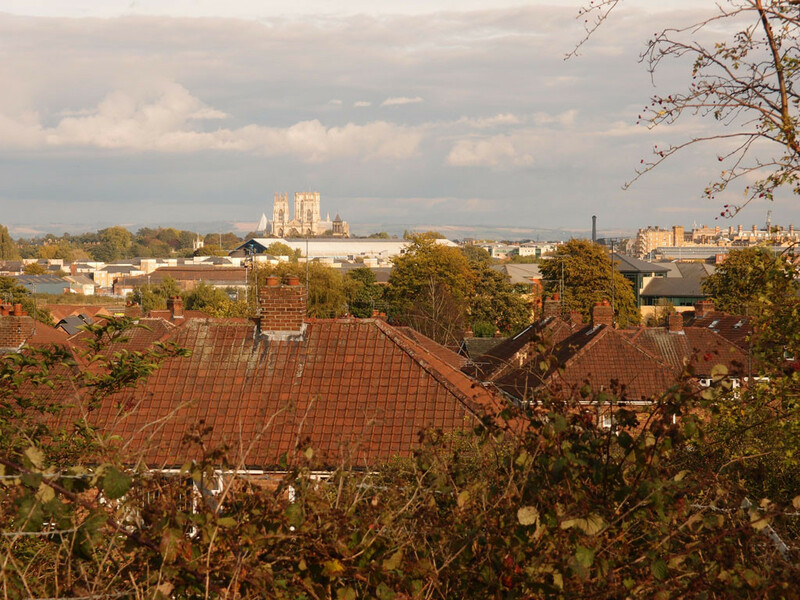 York residents prefer to stay away from the city centre as much as possible as York becomes, increasingly for them, a superficial heritage theme park rather than a viable community. York can take its place among other destinations in Europe suffering the unfortunate consequences of mass tourism. A recent comment here on this site made a similar point about residents staying away from the city centre and shopping out of town instead. I went shopping in Acomb recently, cycling over from Clifton, visiting Savers and Boyes, pleased to see the Herbert Todd shop is still there, getting a few bargains in the charity shops. Impressive number of cycle racks at Acomb shops, and a nice community feel about the place. What’s all this got to do with the Carlton Tavern? One of the more positive aspects I’ve noticed in recent years is how local communities outside the city centre seem to be more focused on their identities as separate settlements, and how much good work is going on to celebrate and build community cohesion around local facilities. 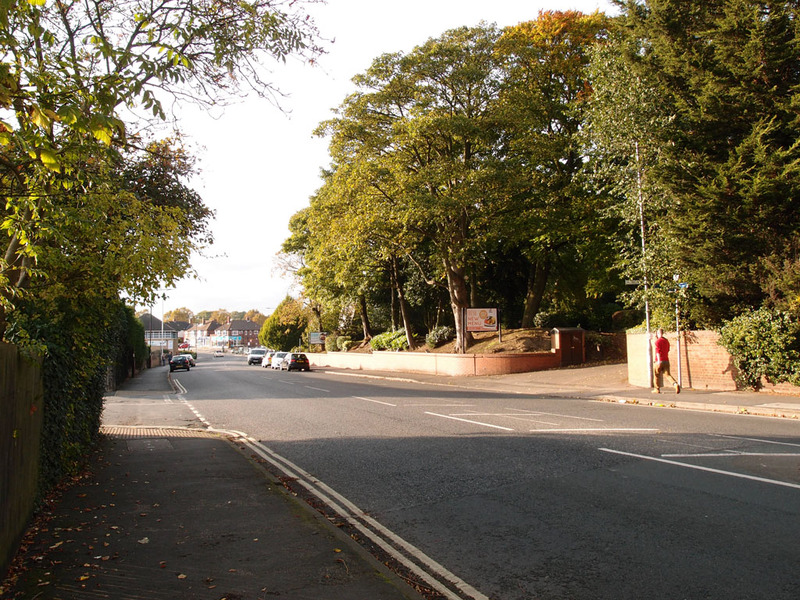 Obviously there’s the famous ‘Bishy Road’, but Holgate and Acomb and Tang Hall all seem to have more projects and groups focused around their particular places. Recognising the built heritage of these places, the buildings and the stories they tell about the development of the place, is a crucial part of strengthening this sense of community. The locally-valued buildings should be protected and cherished just as much as city centre buildings. Why should Acomb/Holgate lose another handsome building and all its stories just because the authority is in a bit of a panic about the care home situation? I’m struggling to understand the thought process of those councillors who voted to approve, at the meeting in October. The officer report (now updated for the 13 December meeting) suggested that things were finely balanced between recommending approval and refusal. The word ‘balance’ occurs over and over in the report. The vote was then perfectly balanced (the same number for and against), until the chair’s casting vote. I hope this time a little more weight will be given to the reasons to refuse, tipping the scale in the right way. I heard comments about ‘heart’ and ‘head’, in the discussion in the webcast. As if the case against demolition is just some soppy cherishing of old things for the sake of it, sentimental and foolish. Looking at this rationally, as I am, I can see no justification for approving the destruction of a building that could be reused in some way. It could just be another demolition, to add to a depressingly long list, or we could try to stop it. There’s an online petition — one way of conveying views to the city’s elected representatives on the planning committee. — to be decided at the planning committee on 13 December. I wrote about it a couple of times before. Impressively quick processing of this one, no objections, how could anyone object. Much-needed replacement for Bootham Park Hospital, on what looks to be the best site of those available. ‘Generally the building is at single storey and two storey at most’ – makes a refreshing change doesn’t it (see below). — mentioned a while back. Erection of part 5/part 6 storey hotel. It appears that the plans don’t include provision for a riverside walkway along that side of the Foss, despite riverside walkways being often mentioned in plans for the wider Castle Gateway area. Our nice notions of riverside walkways might have to be on the other side of the Foss, by the looks of things. — continuing on from earlier developments on the site. They’re wanting to raise the height of part of one of the next blocks planned for the site, making it even more lofty and light-blocking. ‘An increase in the height of Block G, to include an eight storey element on the corner of Hungate and Carmelite Street.’ Some objections, including from York Civic Trust, but recommended for approval. The officer report refers to ‘the provision of much needed dwellings in the City’ being in the scheme’s favour, but of course as we know by now those who need them probably can’t afford them. If you’re interested in reading more about Severus Hill, see Ice and Fire: the mystery of Severus’ Hill, by Liam Herringshaw. The Acomb and Westfield Forum, ‘developing a framework of planning guidance to protect the unique character of our community for the future’. Chill in the Community, ‘a community minded collective’. Acomb Alive represents local traders. Summer sees the ADAM festival (Acomb, Dance, Arts & Music Festival), a community event. In Holgate, Friends of West Bank Park, the Carriage Garden project, and Save Upper St Pauls. On the second vote, the planning application to demolish the Carlton Tavern was refused, as it should have been the first time. Long discussion at today’s meeting, repeating many of the points made at the earlier meeting, but the public speakers in objection were excellent (again), and though it was a close vote it didn’t need a chair’s casting vote. Hurrah. The chair summed up with several references to fears it would be a pyrrhic victory, as the applicants may appeal, but if they’ve any sense they won’t. Too much against their plans for this particular site. I’m surprised that they pursued it for so long. Nothing ‘caring’ about that. The fact that they might appeal shouldn’t mean that our representatives roll over and say okay, and I’m glad that enough of them didn’t to make it go the right way this time. Anyway, here’s the all-important vote, which in this case is in favour of a motion to refuse. (Lots of interest in the discussion before that if you want to watch/listen). It’s at around 1hr 49. The embedded thing below should start at that point. If you’ve enjoyed these pages, found them useful/interesting, virtual coffees are always welcome, thanks. Your piece is interesting but why stop in Acomb? Perhaps you would let me buy you a coffee so I can show you what is happening in Foxwood community? I had to stop where I did because there’s so much going on it’s impossible to do it all justice. The original draft of the page had included other community projects, but I had to edit it down to focus on this particular area. But thanks for promoting Foxwood – members of my family have been part of that community – and particularly liked that there’s a gardening group called ‘Foxgloves’ – brilliant name, made me smile. All the best to Foxwood and Foxgloves for the coming year.